They may be young in years but folk starlet duo Katriona Gilmore and Jamie Roberts have racked up a fair amount of experience on the UK roots and acoustic circuit. With three duo albums behind them (plus new songs beginning to take shape) and an ever increasing number of live gigs under their belt (this was a third visit to the Café), the careers of Kat and Jamie are beginning to gather momentum. 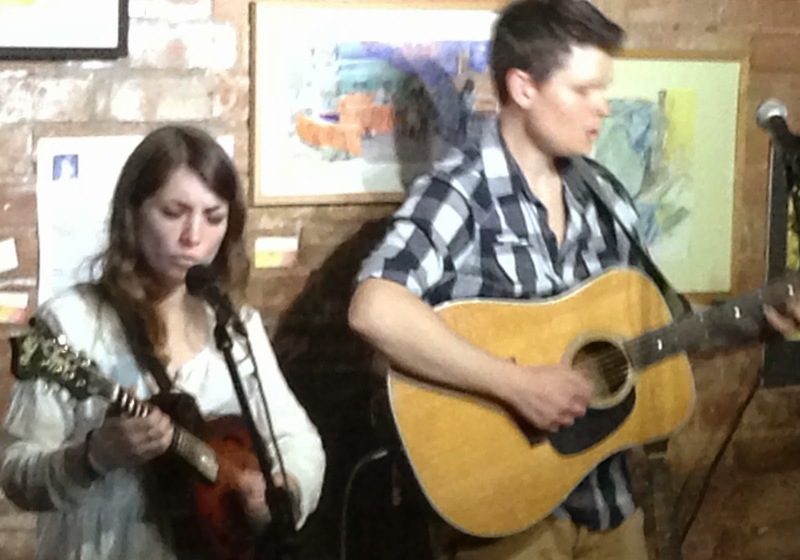 A highly credible turnout for a Sunday evening gig at the Kitchen Garden saw the holy trinity of live acoustic music develop in front of them– great musicianship, engaging vocals and enlightening storytelling interludes. Prior to a twin pair of forty-five minute sets by Kat and Jamie, there was a very entertaining performance by another duo, this time playing under a pseudonym-style name of Rita Payne. This duo houses the vocal talent of Pete Sowerby and the guitar skills of Rhiannon Scutt. They certainly possess an air of confidence to make audiences outside their hometown of Doncaster take notice and are an act to look out for in the future. 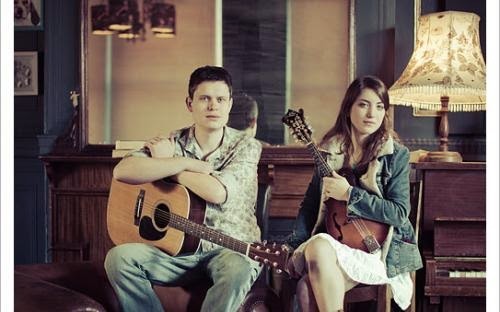 Kat and Jamie made great strides in the folk world when being nominated as Best Duo at the 2013 BBC Radio 2 Folk Awards and their album out at the time, THE INNOCENT LEFT, featured prominently during this latest visit to Birmingham. My own personal favourite from the record ‘Silver Screen’ had its rightful place in the first half of their performance and is probably the closest the pair sound to replicating the feel of rural Appalachian music. Generally the duo deliver a style deep rooted in English traditional song although their musical mode is on the more contemporary wing of the genre. Jamie is a master of a quite unique style of lap percussion guitar playing while Kat excels both on fiddle and mandolin. They both share vocals, occasionally in harmony often in solo, and are very fine intuitive song writers. Apart from the previously mentioned stand out song, the first set had its highlights in Jamie’s perceptive tale of a Subway customer ‘Louis the Boxer’ and a new song ‘Cecilia’ delightfully sung by Kat. The most intriguing story behind the songs in the opening set was Kat’s revelation of the origin for a new track called ‘Stumble on the Seam’, where we learnt of a Derbyshire family discovering a rare mineral many decades apart from its initial find. After a short break, the duo re-ignited the audience with their ear pleasing number ‘Doctor James’. If anything the stories were stepped up following the evening’s second bout of refreshments with Kat’s innuendo wit preluding her fiddle tune ‘The Badger Set’. A more serious tale of wartime correspondence introduced ‘Letters’, while Jamie’s comedy road observations led us into a rendition of ‘Scarecrow’. The humour definitely developed during the evening and it would take far too long to explain the events that led to the audience singing the encore number ‘Fleetwood Fair’ in a German accent. The talents of Katriona Gilmore and Jamie Roberts are there to be cherished, whether folk music is your preferred genre or you just appreciate a duo which can sing, play and entertain. They will be making an initial visit to Canada to play a couple of festivals this summer and mingling with transatlantic influences may lead to some interesting developments in the future especially as there is potential to further exploit an Appalachian roots sound. However in the meantime, Kat returns to Birmingham next month to provide backing support for Blair Dunlop’s band gig at the Hare and Hounds.